A News Release (press release, media release, press statement) is used to announce something newsworthy to members of the news media. A news release takes a standard format that allows members of the media to quickly and easily pick out the most important aspects and write a full article or report from it. The headline is used both to gain the attention of the editor, as well as sum up the news of the piece. While this headline will more than likely not be used, it should serve the same purpose as a title for the piece. Your headline should be accurate and brief, and used to gain the attention of the editor. The lead paragraph holds the primary facts about the article, and should answer the questions: who, what, where, when, and why? If space is an issue in a newspaper, editors will begin cutting from the bottom, up. It is important then to put your most important information near the top, as well as your organization’s name to gain attention. 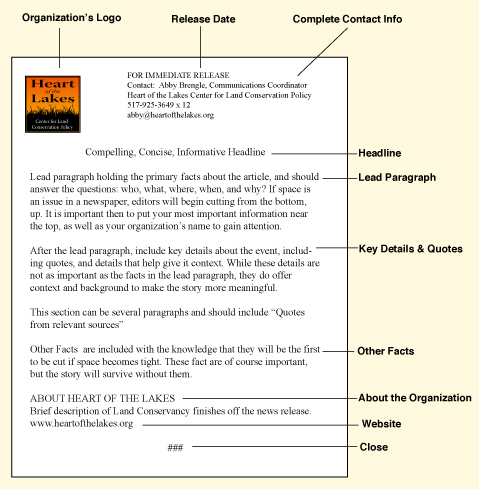 After the lead paragraph, include key details about the event, including quotes, and details that help give it context. While these details are not as important as the facts in the lead paragraph, they do offer context and background to make the story more meaningful. Include any relevant facts in the final paragraphs, with the knowledge that they will be the first to be cut if space becomes tight. These fact are of course important, but the story will survive without them. A Press Release should fit on one page, and at the absolute most, two. Additional information can be included in the form of fact sheets and documents in the Press Kit (link). News is generally written with short simple sentence construction and aim at readers with a range of reading abilities. While tempting, don’t stray from the facts of the story in the press release, as it deters from the story itself. By sticking to facts, your news release will sound less like an advertisement, and therefore will be more attractive to editors. Your story should be of interest to a wide range of people. Remember that people find other people interesting. When possible tell your message as a story and put people in it. Local papers especially look for a local angle to a story. The ideal story is both relevant to the readers’ interest and daily lives. Write with nouns and verbs, avoiding adjectives and adverbs, which seldom add to the story. Use active voice, and write in simple, ordinary English. Don’t be afraid to draft, it might take several passes to achieve a clear, concise, and meaningful news release.